Through superior strength, incredible beauty and an unparalleled distribution network, Silestone is rapidly becoming the choice for discerning consumers. There are many advantages to using Silestone: since it is a surface that is manufactured from natural quartz, it is a surface highly resistant to stains and scratches, and has a low level of fluid absorption. Silestone comes in over 60 quartz colors for countertops, two textures and several different formats, which make it extremely versatile, and can even be used in large pieces without requiring any joins. Silestone is perfect for use in a great many applications in the kitchen and bathroom. The quartz in Silestone makes it naturally scratch-resistant. Only three other natural minerals – diamond, sapphire and topaz – are harder than quartz. Quartz is a seven on Mohs Hardness Scale (diamond is a 10). So, while a careless slip of the knife will scratch most other countertops such as laminates and solid surfaces, it won’t leave a mark on Silestone. 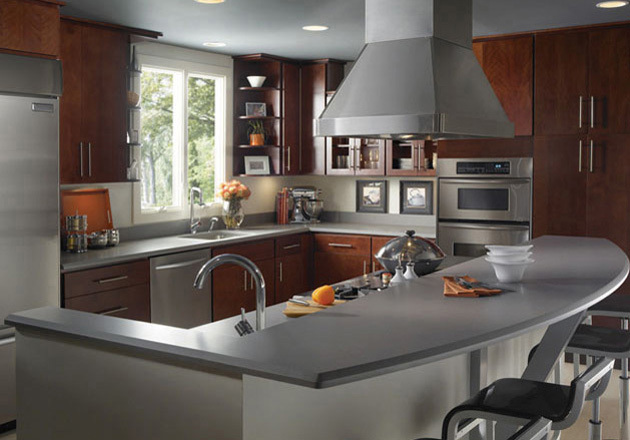 Although Silestone is durable, it is not scratch-proof; it could be damaged with excessive force or pressure. In North America, Silestone is available through approximately 3,500 retailers including The Home Depot®, e-counters.com, as well as a variety of kitchen and bath retailers, cabinet shops, tile/flooring outlets, designers’ showrooms, architectural firms, builders, and more. Silestone is available through a mature network of dedicated distributors and fabricators backed by the experience of Cosentino with more than 70 years in the natural stone industry. Plus, Certified Silestone Installers are trained through a unique curriculum that includes expert, hands-on training. Silestone leads its category in innovative ideas for a product that already is known for its ingenious physical properties and customer benefits. Silestone offers the most colors in natural quartz; the most innovative sink installation methods, such as integrated, flush- and bevel-mounted; and the latest, newest products such as the exclusive Silestone Leather™ with bacteriostatic product protection.